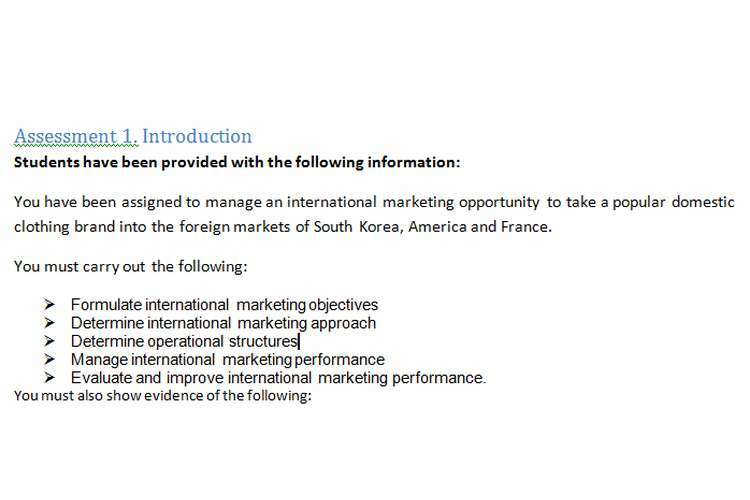 Evaluate and improve international marketing performance. Present your plan as a portfolio. Please ensure you label each project with your name, student ID, unit code, title and assessment name. This is Assessment 1. 1.What things do you need to consider when assessing a marketing opportunity for viability? 2.What are SMART objectives? Explain. 3.Give two examples of measurable objectives. 4.What things do you need to consider when estimating what you can achieve in the international market? 5.What are the advantages and disadvantages of the various types of marketing approaches? 7. What considerations must you make before choosing an operational structure? 8. What methods do you use to communicate international marketing objectives across your organisation? Why do you use these methods? 9. What roles exist in a marketing effort? What responsibilities come with them? 10. What are the different elements of the marketing mix? 11. Choose three international markets and outline the cross-cultural communication and negotiation styles relevant to them. 12. What steps might you need to take to manage the marketing effort to ensure it is directed towards areas of greatest potential for the organisation? 13. Give some examples of promotional and sales activities. 14. What monitoring processes can you use to keep track of the product, pricing and distribution policies in relation to market changes, objectives of marketing plan and organisational requirements? 15. How can marketing metrics be used to measure success against performance targets? 16. What is performance gap analysis and how can it be used to improve international marketing performance? 17. What are market phenomena and how should you approach their analysis? 18. What market phenomena have emerged in your industry in the past ten years? What effects have they had?